On Sunday we are looking at the most well-known passage of James. The passage where James says “faith without works is dead”. And we are going to wander into this world and statement of James and explore some of the tension with what he is teaching. And there is a tension because Paul says this in Romans, “So we are made right with God through faith and not by works”. There is this tension that we want to explore theologically, but then also practically with our lives. So with that why not read all of James 2, to hear his arguments, and thoughts before Sunday. Let his words rattle around a little bit, because the beauty of James is that as he rattles around – he will shake things up. And that’s what we need. What good is it, dear brothers and sisters, if you say you have faith but don’t show it by your actions? Can that kind of faith save anyone? Suppose you see a brother or sister who has no food or clothing, and you say, “Good-bye and have a good day; stay warm and eat well”—but then you don’t give that person any food or clothing. What good does that do? So you see, faith by itself isn’t enough. Unless it produces good deeds, it is dead and useless. Now someone may argue, “Some people have faith; others have good deeds.” But I say, “How can you show me your faith if you don’t have good deeds? I will show you my faith by my good deeds.” You say you have faith, for you believe that there is one God. Good for you! Even the demons believe this, and they tremble in terror. How foolish! 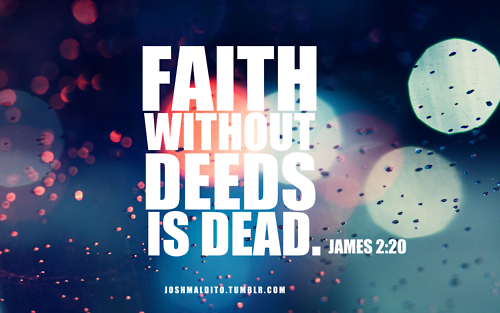 Can’t you see that faith without good deeds is useless? Don’t you remember that our ancestor Abraham was shown to be right with God by his actions when he offered his son Isaac on the altar? You see, his faith and his actions worked together. His actions made his faith complete. And so it happened just as the Scriptures say: “Abraham believed God, and God counted him as righteous because of his faith.” He was even called the friend of God. So you see, we are shown to be right with God by what we do, not by faith alone. Rahab the prostitute is another example. She was shown to be right with God by her actions when she hid those messengers and sent them safely away by a different road. Just as the body is dead without breath, so also faith is dead without good works.